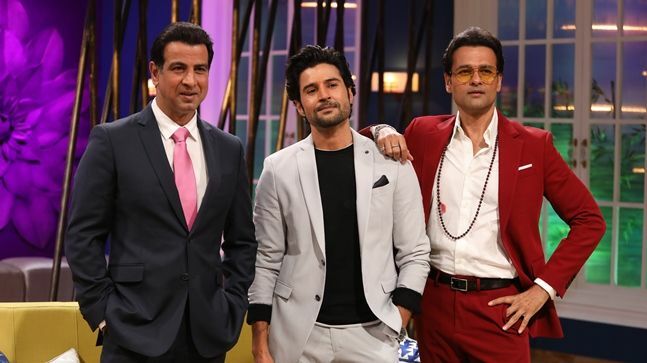 Everyone knows that Ronit Roy and Rohit Roy are brothers and are an integral part of entertainment industry. What we probably do not know is that the two are as different as chalk and cheese, and their journey too has been entirely different. In TV industry Ronit is popularly known as Mr. Bajaj of Kasauti Zindagi Kay, while Rohit shot to fame with his role of Rishabh in Swabhimaan. The two recently worked on Hrithik Roshan-starrer Kaabil together and that too as brothers. The duo on Saturday appeared on the first episode of Rajeev Khandelwal’s chat show Juzz Baatt and opened up on things close to their hearts. 1. When Ronit delivered a superhit Jaan Tere Naam, Rohit was probably not even thinking of pursuing a career in entertainment industry, and when the elder brother Ronit ran out of luck in films, Rohit shot to popular fame with Mahesh Bhatt’s Swabhimaan. There was a time when Ronit did not have enough food to eat, and he would go to Rohit’s house for his meals. 2. Interestingly, it is Ronit who rarely goes out, meet with people or hang out, had more girlfriends before his marriage than Rohit, who’s considered more flamboyant and social. Rohit reveals that he just had one girlfriend Archana Joshi before getting married to wife Manasi Joshi and also shared some shockingly common things between the two ladies. He said that while Manasi was based in Maharashtra, but is from Gujarat, Archana was based in Ahmedabad, but was a Maharashtrian. Ronit revealed he did not really keep a count of his girlfriends as there were many. 3. Udaan star Ronit says that his wife Neelam is the in-charge of nearly all his things–including finance and kitchen. 4. Shootout at Lokhandwala star Rohit revealed that his elder brother Ronit was a goonda of his colony while their growing up days and always wanted to become a hero. Ronit in his defence said that they lived in an area where you could either beat or take the beating. 5. Ronit said that his father passed away very early, and he considered Subhash Ghai as a father figure. But he has never ever asked him why he didn’t cast him in a film so far. Ronit says at one point, there was a strong rumour that Ghai would cast him in Pardes, but later on some other guy was selected. 6. Rohit says he is closer to his mother than Ronit because he stayed with her for a longer time than Ronit, who was struggling in Mumbai. Rohit is also the one who gets more scolded than his brother. 7. Rohit says that Ronit was always a father figure, but he is happy that now he is also a friend.